This was the view from my kitchen this morning. 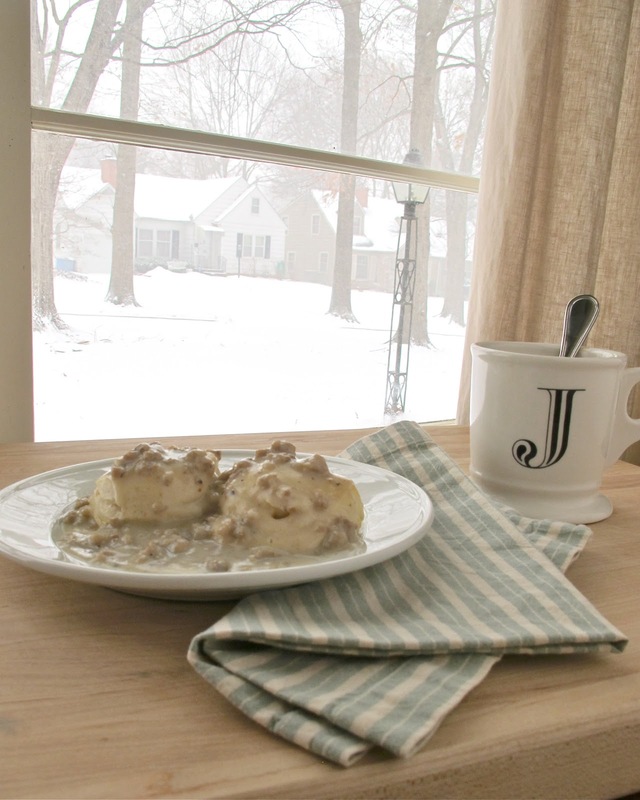 We slept in and made some 'stick-to-your-ribs' biscuits and gravy to get us through the day. I love biscuits and gravy. There is nothing healthy about it - at all. But, it does fill me up for the entire day... that's worth something, right? If you're feeling up to it, you can make homemade biscuits, but I like to use the drop biscuit recipe on the Jiffy Baking Mix box. It's an oldie, but a goody. In a bowl, stir together the ingredients with a fork just until combine. Then with your hands form 4 biscuits and put them on a baking sheet. Bake for 6-8 minutes at 375 degrees. In a large skillet, brown the sausage on medium heat until it is fully cooked. Sprinkle flour over the sausage and stir it together until coated. Cook for 1-2 minutes. Add milk in and stir until it forms a gravy. Cook over medium low for 3-5 minutes. You may need to add more milk if it gets too thick as it cooks. Serve it over the biscuits.